Konami could release the same old 2-D Castlevania every couple of years from now until the world finally explodes, and you know what? I'd be ok with that. I hate change just for the sake of change, and I'm convinced if there is one video game series that should be the same each and every time, It's Castlevania. The latest DS installment plays just like the previous games you've come to know and love, but a new weapon system and adventure-like feel will make the series seem as fresh as ever.Konami brought what seemed to be their entire holiday lineup to New York City yesterday. There was a ton of stuff to try out, including a few new titles, but the first thing I wanted to check out, besides the open bar, was Order of Ecclesia for DS. To say I was looking forward to this game would be an understatement. In fact, it's the only DS game I plan on picking up the first day it comes out. Along with the female lead, the most immediate change you'll notice when you start is the absence of any and all anime character art styles. I was never 'for' or 'against' them in the first place, but I know there was a contingent of fans out there that pleaded they be changed to a more mature look. See, bitching and complaining does work! The new Glyph attack system is very similar to the soul system in Dawn of Sorrow. But rather than just collecting new, sometimes useable abilities and enhancements from enemies, the Glyphs make up your entire weapon arsenal. There are three slots to assign a Glyph. Your primary and secondary attack (Y and X buttons), and a special ability (right shoulder button). What's even more interesting is you can assign the same glyph more than once. 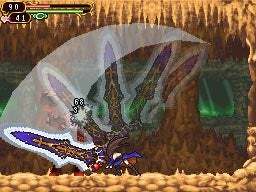 For example, the first Glyph I acquired was the Confodere, a short sword, which I equipped to both the attack buttons. I'm allowed to then alternate attacks very quickly which makes killing much faster. However, each attack used lowers your total magic bar just a bit, which eventually refills itself after a second or two of keeping your weapons holstered. This prevents you from spamming the hell out of your attacks and making the game a breeze to play through (see: Crissaegrim). If I assign, say, a throwing dagger to one attack along with my short sword on the other, I can do combo-like attacks and intermix all sorts of weapon types. The game is said to have over 100 weapon combinations, so it seems like there will be a lot of customization options. The only R button ability I got during my playthrough created a bubble-like field around our heroine. This allows her to gravitate to these specially placed pegs and, by pressing down and releasing, makes her zoom through the air to previously unreachable areas. As for stylus controls, I didn't have to use any throughout my time with it. The other two Castlevania DS games used very little as well, so I expect this game to do the same. Also, it looks like you'll no loner be exploring one large map anymore. After I completed the initial trial stage, I was brought to *shock* an overworld map. What? Yes, as you complete stages, more and more areas open up for you to travel to, including a village where you can wander around inside the local's houses. There are 20 area's total to explore, but it's unclear right now how big they all are. The early parts I played through were pretty small, though. I really wanted to just stay there and play this all day, but unfortunately other people wanted a turn. I thankfully won't have to wait too long to get my hands on a retail copy as the game comes out next month! Long live 2-D!